The Junior Market is up 7.5 percent for the year to date, helped considerably by three new listings since late December and recovery in the prices of three Lasco companies and a few others. Investors pushed Treasury bill rates sharply down by 22 percent from 4.63 in December to 3.593 percent in February, while the central bank cut their overnight rates in sympathy to 2.75 percent. On the other hand profit results of companies have been mixed with some showing strong gains and others no so strong. So far stocks prices have yet to move to factor in the lower interest rates. One company that had good 2017 results was ISP Finance but increased bad debt provisioning curtailed the growth in profits to just one percent after tax, but 20 percent ahead of the net 2016 profits with a 25 percent rise in revenues. The results for 2017 resulted in earnings per share being reduced to $1.20 for 2018 and with a rise in the stock price to $11.05 it is no longer in the TOP stocks. Also going out are, Access Financial and Paramount Trading. Access earnings have been reduced following their third quarter 2017 results. 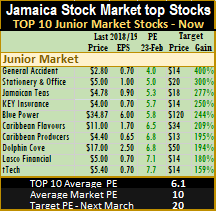 Entering the TOP 10 Junior Market list are tTech, Lasco Financial and Blue Power. While Lasco Financial had lower profit in the December 2017 quarter than in 2016 that was due to added cost associated with the acquisition of Credi Scotia. The company will see a big jump in profit as a result of the acquisition. tTech is said to be seeing strong growth in clientele following a few years of soliciting new clients business. General Accident had a temporary setback in profit in 2017 due to a major claim but rising premium income margin should help boost profit in 2018 barring any major catastrophic claims. Key Insurance despite incurring cost associated with staff separation amounting to close to $50 million reported improved results for 2017 over 2016 and should go on to record the highest levels of profit in 2018 with expected better margin on insurance underwriting barring any unusually large claims. Stationery and Office had a record 2018 performance and is expected to show improve results in 2018 that will move the price upwards. At the close of Friday, the average PE ratio for Junior Market Top stocks ended at 6.3 compared to an average PE for the overall main market is 10 based on 2018 estimated earnings. IC Insider.com’s TOP 10 stocks now trade at an average discount of 39 percent to the average for the Junior Market Top stocks but its less than 50 percent of what the average PE for the year is likely to be, of 15 to 20 times earnings.